From Backgammon Times, Volume 2, Number 4, Fall 1982. Slottingplaying a single blot to a vacant point with the intention of covering it with another blot on a subsequent rollis to the expert as splitting is to the novice. This comparison is a fair one since the novice is afraid of exposing a new man by slotting so he consequently splits his back men; the expert is afraid of breaking an anchor in his opponent's inner board, so he prefers to slot in his own home board. It comes down to a matter of which is saferslotting or splitting. But here our analogy falls short, for the novice splits for fundamentally different reasons, that is, to avoid having a new man hit, while the expert slots specifically to improve his position by building a blockade. 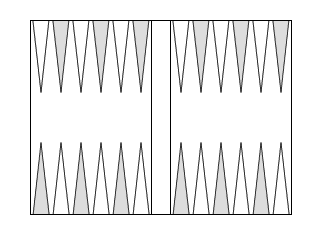 Suffice it to say that slotting is a sound and often necessary tactic in backgammon. The problem then is knowing when to, and when not to, slot. Don't slot when your opponent has split his back men since so doing would expose your blot to a direct double shot. It is generally advisable not to slot when you have split your back men in the enemy home board. Slotting would create too many blots vulnerable to enemy attack. In other words, don't slot if you have forteited an anchor in the opponent's home board. Don't slot when you have a good chance of making a desired point without slotting. If you have numerous builders converging on a needed point, slotting would entail an unnecessary risk. Sometimes you are forced to slot; that is, your roll requires you to expose a man to direct attack. When this happens, slot the point that will result in the most constructive position should you not be hit. If that isn't possible, slot the point that will do you the least harm if you should be hit. When the enemy has blots exposed in his home board, it's often a good tactic to take the chance and slot. Then, should the opponent hit you, his blots would be exposed to attack from your men coming in. It is often advisable to slot to get men that are otherwise out of play into action. Extra builders, especially on the 6 point, frequently must be slotted to get them into play. Particularly with opening rolls (5-1, 4-1, 2-1), the ace is often used to build on one's own 5 point. Though entailing some risk, this play affords considerable advantage when you succeed in completing an anchor on the following roll. Slot to make an important point that you would have trouble making otherwise. When the effectiveness of your blocking position depends on your having a certain point, slotting is often the surest and most efficient way of securing it. How good is my opponent's inner board? Do I have an anchor there? How strong is my own home board? Experience is the best way to wend your way through these problems, but one more principle should take precedence. The fewer the number of men your opponent has in your inner board, the more aggressively you should slot. In the diagrammed position we have the clearest example of a required slot. Black is on the bar and must come in to the enemy 23 point. the remaining four, perhaps a little nervously, must go to slotting Black's 5 point, as Black desperately needs this point to create a full prime. If White does not roll an immediate four, his strong blocking position on the other side of the board will begin to crumble. Black, by slotting his 5 point, makes himself a better than two-to-one favorite. No other play would have achieved such an advantage. This risk is more than compensated for by the reward.